How can you identify the exotic tree growing in the back yard of your newly-purchased property? There is a simple, fool-proof way to find out. How will you know if your new neighbor is the Christian he says he is? Does it matter if his deeds don't match his profession? What does the Bible say? You know a fruit tree by the fruit it produces. Simple, isn’t it? Fruit and nut trees were nothing strange to Lewis Showalter. Lewis bred black walnut trees in the Shenandoah Valley of Virginia for thirty years. He even developed some new varieties of his own, like the “Shenandoah.” To do this he carefully selected limbs from promising trees. Tenderly he grafted these shoots onto properly prepared rootstock. Mr. Showalter watched attentively as the new limbs grew and finally became nut-bearing trees. But Lewis Showalter never decided to propagate or cull a new variety based on the tree itself. He judged it by the quality and quantity of its nuts. Each year he painstakingly weighed the total pounds of dry nuts produced on each tree. When he cracked the hard shells and drew out the tasty meats, he weighed them again. Next he figured out the percentage of meats compared to shells. Then based on the fruit (the nuts) he selected his choice new varieties. You, too, evaluate all fruit-bearing plants in the same way Lewis did—by their fruits. Juicy peaches, tart strawberries, luscious blueberries, delectable cherries, shiny apples—it is always the fruit that counts. It works the same way in the human heart as it does on fruit trees. You can judge a person’s heart by the works he does. Spiritual fruit means the good works you do, not your good intentions or your invisible faith. The plainly tangible deeds you do are the ones I am thinking about. When you go to bed each night, what kind of deeds do you remember having done that day? Are they kind, thoughtful, helpful, and pure deeds? Or do they smack of selfishness, impurity, greed, meanness, and impatience? Is it hard for you to decide? Now, what kind of fruit do others see in your life when they are the fruit inspectors? Or more importantly, what will Jesus say when He inspects your fruit? Will He find the fruit of your life rotten, wormy, flavorless, or all shell with no good meat inside? Can you visualize your deeds in the Master’s hands as choice, tasty, and abundant fruit? 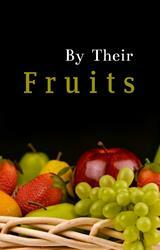 Your answers are important because Jesus taught, “By their fruits ye shall know them” (Matthew 7:20). Jesus wanted us to know He will judge all men by their works. Works prove what dwells in the heart. Secondly, Jesus taught, “By their fruits ye shall know them,” because He wanted us to judge other men’s hearts by their deeds. In this passage He especially mentions discerning between true teachers and false teachers. 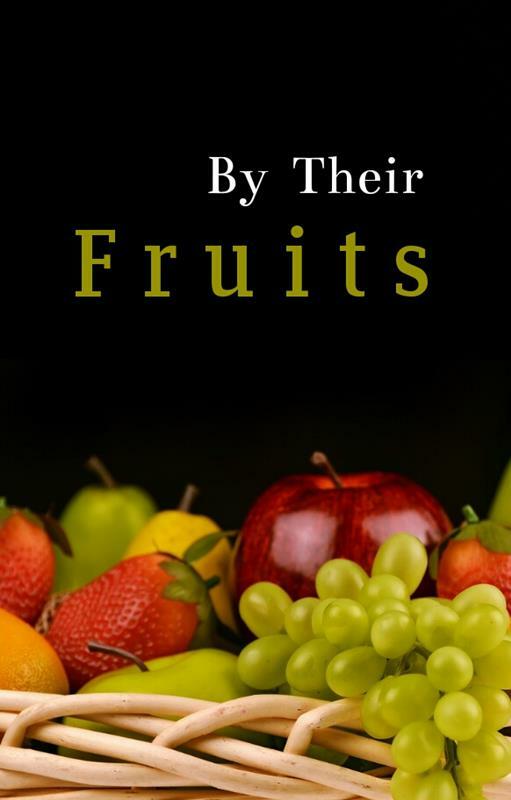 Jesus explains how the fruit men produce tells us what kind of teachers they are. He was not talking about His discerning the faith of the invisible heart. Instead, He was talking about our understanding the invisible beliefs of others—by their fruits, by their deeds. So we should keep our eyes open—making sure the deeds and words of others match up. We want to be sure we do not excuse ourselves from bearing good fruit either. But wait! Do not rush out and try doing a lot of good deeds to cover up an evil heart or evil deeds. It will not work! Grapes do not grow on thorn bushes. Figs do not grow on thistles. You must have the right kind of rootstock to bear good fruit. So if your life is barren, producing evil fruit, let Jesus Christ purge it now. Then watch the beautiful fruit burst forth from the tender shoots of your new life. Good fruit (good works) will be a natural result. All men are looking for good works from Christians. They judge a Christian’s faith by his works. All men also judge a man’s lack of faith by evil works. Christians, too, are supposed to judge men the same way. Evil deeds mean an evil heart—regardless of what a man says.